With the launch of its new ultra-portable 12-inch MacBook, Apple has signaled that the future of notebooks is here. The future does indeed look bright, though the initial cost and compromises made in building the new MacBook should keep most people from buying in —for the first generation, at least. The new MacBook is astonishingly thin, and yet it still features a gorgeous Retina display of the same caliber found on the company's MacBook pro lineup. Achieving this super-thin design required some engineering ingenuity, but also some compromises. The new MacBook starts at $1,299 for a base model with 256 gigabytes of storage, a 1.1-gigahertz Intel Core M processor, and 8 gigabytes of RAM. For our review, we tested the high-end model which runs $1,599 and includes 512 gigabytes of storage, a 1.2-gigahertz Intel Core M CPU, and 8 gigabytes of RAM. Both models feature Intel's integrated HD Graphics 5300 and feature a 2,304-by-1,4400-pixel Retina display, packing in 226 pixels per inch. The display is impressive, and there isn't much more we can say about it that we haven't already said about the same panels found in Apple's MacBook Pro lineup. Perhaps the most noticeable compromise made in the new MacBook comes in the form of its completely redesigned keyboard. Apple made a big deal out of this change when it unveiled the MacBook last month, and with good reason. Right out of the box, it's immediately clear that the new keyboard feels different. To achieve the ultra-portable design of the MacBook, Apple made shallower keys that do not travel as much as on a traditional MacBook Pro or legacy MacBook Air. 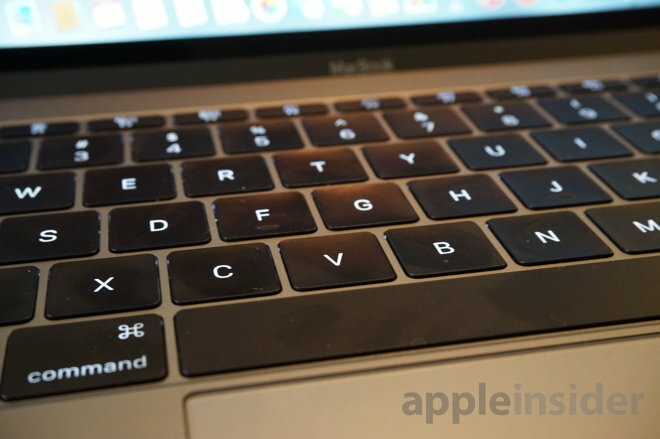 The difference is noticeable, and some keyboard purists who have grown accustomed to the chiclet style keys on Apple's notebooks will be bothered by the change. We weren't so concerned, however. While the keyboard certainly feels different, we also had no problem adapting to its revised design. We were able to type just as fast and efficiently as on a MacBook Pro. 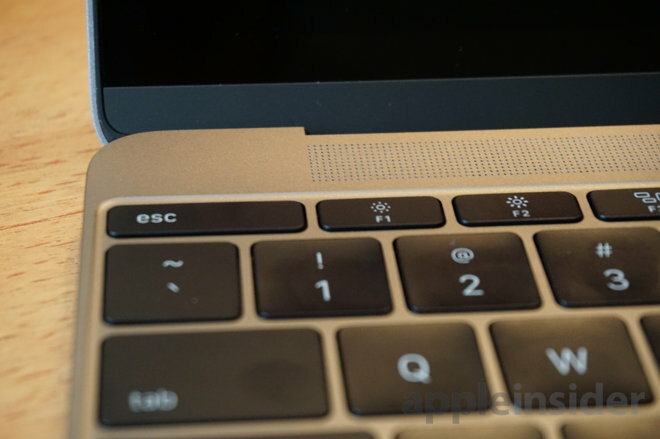 This entire review was written on the new MacBook's keyboard. 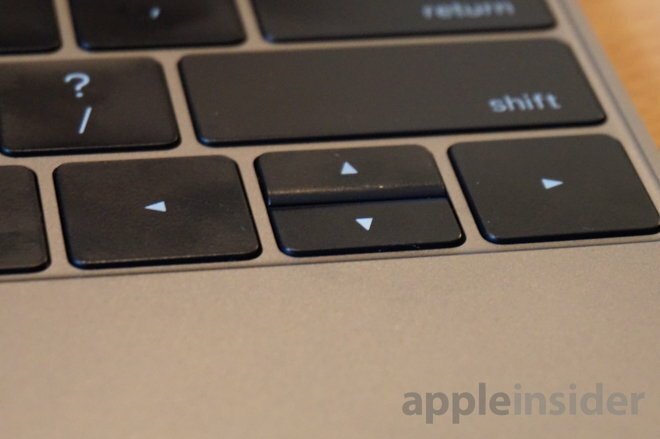 In a bit of a strange and clearly aesthetic-driven choice, the Macbook features full-size keys for the left and right arrows, but half-keys for the up and down arrows. As frequent users of the arrow keys, we found ourselves frequently hitting the up key accidentally when we meant to move the cursor downward. Apple also chose to make the Escape key in the upper left corner elongated. Again, this is presumably purely for aesthetic reasons, to allow the entirety of the keyboard to achieve a rectangular shape with no varying sizes of gaps. It's also backlit. 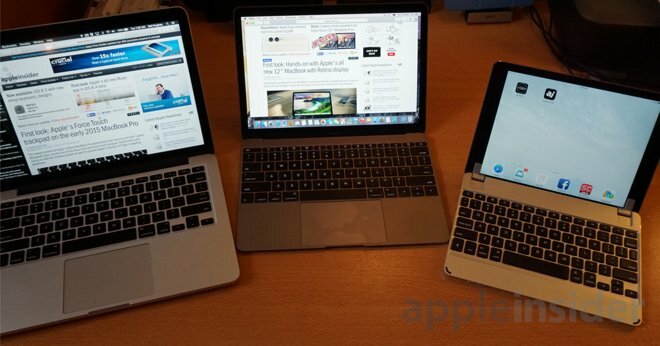 Of all the compromises made on the new MacBook, we think the keyboard will be one of the least bothersome for users. Another redesigned element in the new MacBook is the trackpad, which now features a click-less design that instead emulates the feeling of a click with haptic feedback. The trackpad is also pressure sensitive, meaning new input methods are capable based on how hard a user presses. 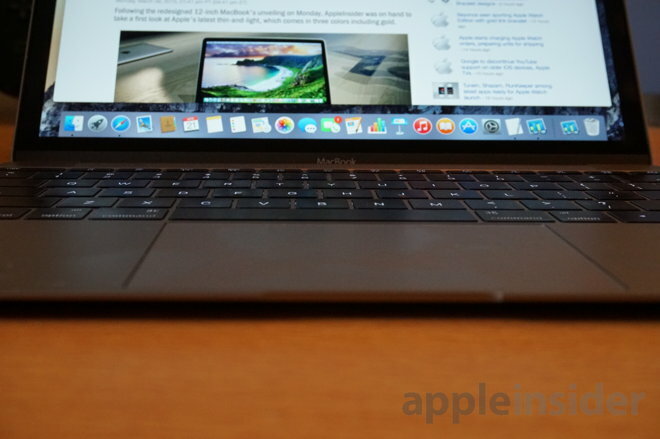 We previously had the chance to get accustomed to the Force Touch trackpad on a 13-inch MacBook Pro, and we're pleased to say that the trackpad is no different on the new MacBook. Just as before, it really does feel as though you're clicking the trackpad, even though it barely moves. Pressing down not only gives the feeling of clicking, but also comes with a soft, satisfying audible sound. Together, it feels just like a traditional trackpad— but this one can be clicked anywhere, and not just in the bottom half. The Force Touch trackpad has helped to pave the way for the MacBook's super-thin design, and undoubtedly other future notebooks from Apple. It's an impressive technical achievement, and another "compromise" in design that we wholeheartedly welcome. This is where the compromises start to become more serious. We'll get the obvious out of the way: Yes, it only has one port for charging and accessories. Yes, it's new and will require an adapter for most of your legacy devices. The MacBook is very much inspired by the iPad, as evidenced by the fact that it comes in three colors: silver, gold and space gray. Like the iPad, it also features just two ports: a standard 3.5-millimeter headphone jack, and another for charging and data transfer. 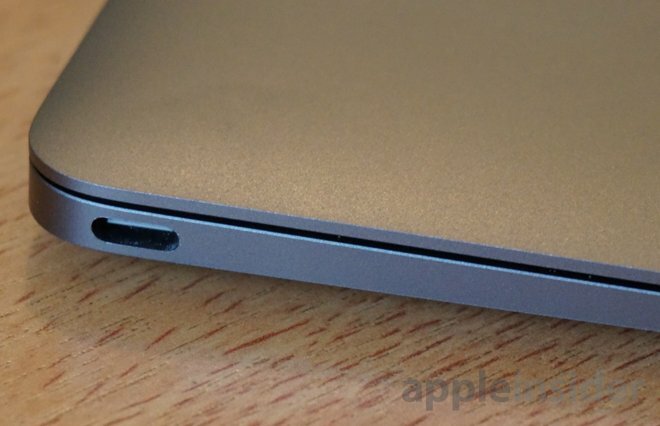 But while the iPad (and iPhone) use Apple's proprietary Lightning connector, the MacBook features a new USB-C connector. And it's just a single connector for charging, syncing, and everything else. Here's where Apple's vision of the future begins to take hold, and the MacBook's role as a work-focused machine gets diminished. Apple makes no apologies for the switch to USB-C. That means that the company has not shipped any sort of USB-C adapter or splitter with the machine. Inside the box, you'll get a USB-C to USB-C cable, and a 29-watt USB-C power adapter that looks much like an iPad power adapter. If you want to use legacy USB devices, or if you want to charge and plug in an accessory at the same time, you'll need to buy your own adapter. Options, at the moment, are limited. 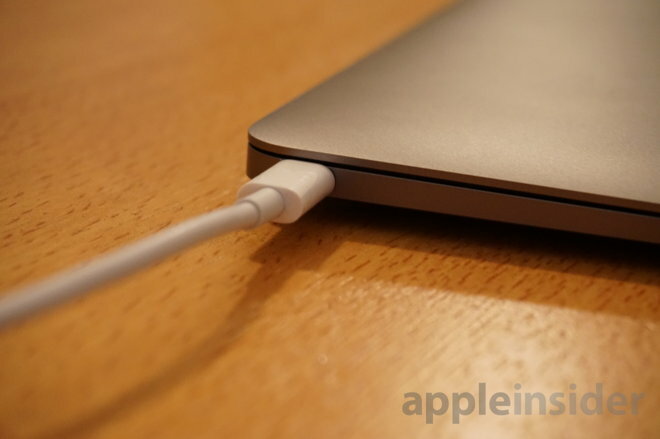 It's not surprising that Apple does not ship any sort of USB-C adapter with the new MacBook. But it also sets the tone that this is not a machine meant for most professional users. Even more bothersome, to us, is the fact that Apple's single-port design has apparently signaled the end of MagSafe. Long a defining —and exclusive— feature of Apple's portable machines, MagSafe has saved our MacBooks from potential disaster countless times. The reversible USB-C cord is inserted easily, but it does not unplug with such ease. And given the light 2.03-pound body, if someone trips on your MacBook power cord, your new $1,300 notebook will take flight. If our new USB-C overlords are inevitable, that's fine. USB-C cables and accessories will become available and the port itself won't matter. 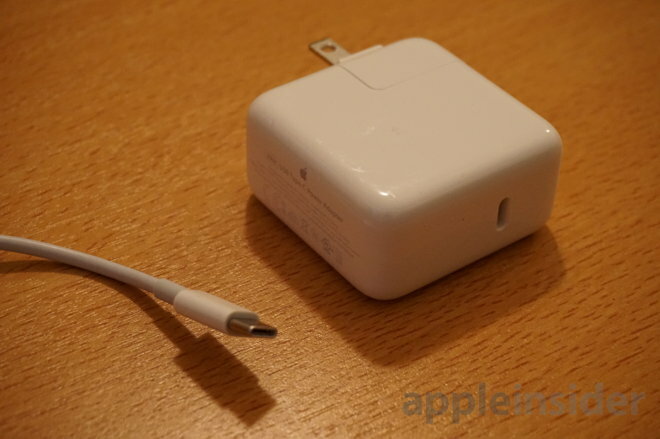 Replacing MagSafe, however, feels like a step backwards in some ways. Sure it will allow for cheaper third-party charging cables. 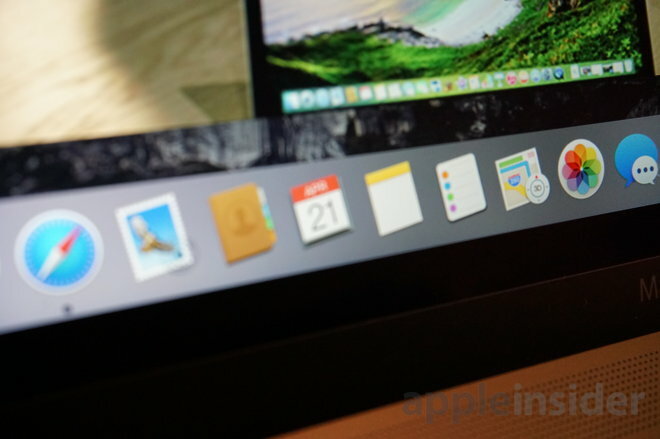 But it also kills one of our favorite features from the MacBook lineup. It feels like a compromise that goes just a little too far. The Core M processor in the new MacBook is not fast. In our tests, the high-end model with a 1.2-gigahertz base clock speed earned a 2,393 single-core score in GeekBench, while the multi-core score was 4,800. In contrast, the base configuration of Apple's latest MacBook Pro yielded a multi-core score of 6,689. But that laptop also features MagSafe, two Thunderbolt 2 ports, two full-size USB 3.0 ports, an SD card slot, and an HDMI port. 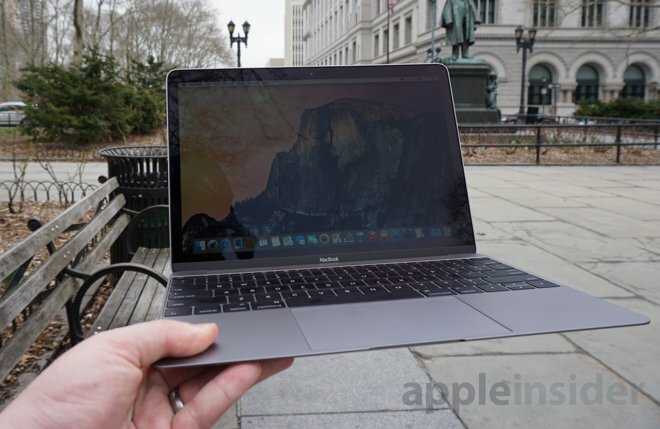 Given the lack of ports and connectivity options on the new MacBook, no serious professional or power user is going to make the diminutive notebook their primary machine. The Intel Core M CPU only drives that point home. But what about the MacBook Air? Apple recently updated its legacy thin-and-light design with Intel's latest Broadwell processors. Public GeekBench scores for the early 2015 update show the 13-inch model with the cheapest Intel processor scoring 5,186 on the multi-core test. What the chip does allow Apple to do is achieve the new ultra-thin design. 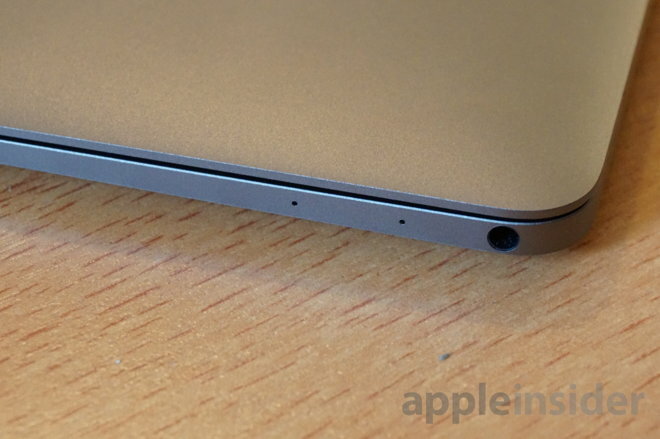 Inside, the MacBook is almost all battery, again taking a design cue from the iPad. The power-sipping Core M processor also enables the MacBook and its svelte 2-pound frame to still achieve an advertised 9 hours of battery life, thanks to a power draw of just 4.5 watts. Our tests supported Apple's own battery life claims, as we found the new MacBook got through an entire workday at lower brightness with plenty to spare. In a more extreme test, with maximum brightness and streaming high-definition video, we got around six hours of uptime before the MacBook warned us it needed to be plugged in. 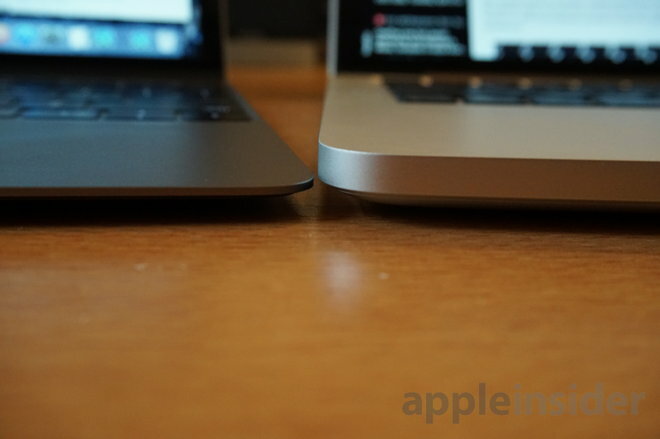 And in a first for an Apple notebook, the new MacBook is completely fanless. Operation of the device is totally silent, and we never encountered any noticeable warmth or heat from using the unit on our lap. When we say the MacBook is all-new, we mean it. From top to bottom, this is a reimagining of the modern notebook, with a lot of new technology introduced, and an indication of which directions Apple will head next. The MacBook is a groundbreaking achievement, and like the first MacBook Air before it, seems poised to set the standard for notebooks going forward. 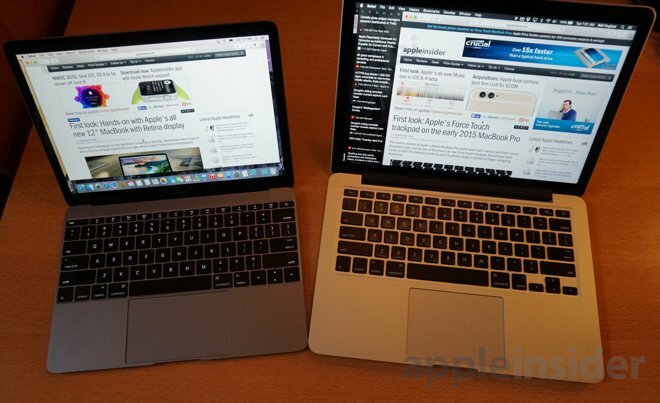 But also like the MacBook Air before it, Apple's approach feels like it's in need of some refinement. Prospective buyers of the MacBook will need to ask themselves what they plan to use the notebook for. With just a single port for syncing and charging, and Intel's power-sipping Core M processor, this is clearly not a machine for someone who wants to do a great deal of high-end video and photo editing, for example. For a more casual user who wants to stay connected on the go, and for whom an iPad just doesn't offer enough functionality, the MacBook is a great choice. But even there, the $1,300 entry price makes it a tough sell. Apple has done some things to up the value proposition, however. You can't even get a MacBook with less than 256 gigabytes of solid-state storage —a welcome upgrade befitting of this notebook's premium status. The construction is also top-notch, and the addition of a high-resolution Retina display sets this apart from Apple's more affordable MacBook Air lineup. 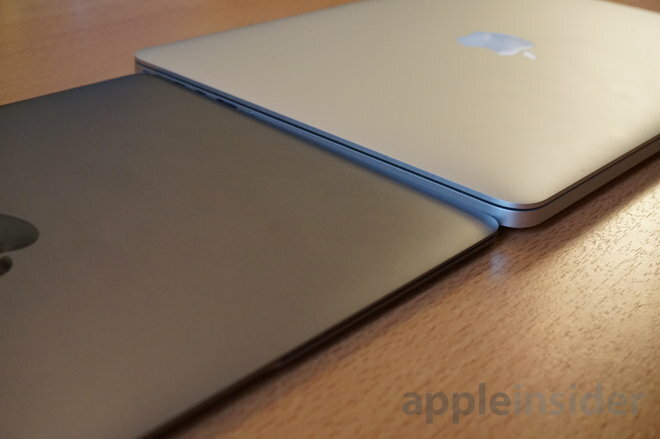 But for just $899, Apple offers the 11-inch MacBook Air, though it lacks a Retina display. And the bulkier —but more powerful —MacBook Pro starts at the same $1,299 price as the new MacBook. Though it's a sign of things to come, for now the MacBook is stuck in the middle, too underpowered for serious users, and too costly for most casual use. Only the most aggressive of early adopters, and those who crave portability above all else, should buy this new MacBook. The rest of the world can wait to catch up to the future. Apple's 12-inch MacBook with Retina display remains in tight supply but is available for order with official pricing starting at $1,299 for a base model with a 1.1GHz processor, 8GB of RAM and a 256GB of solid state storage. Models with a 1.3GHz processor and twice the storage fetch $1,749. Several Apple Authorized Resellers are already offering marginal $10 discounts on the MacBook itself, as can be seen in our Mac Price Guide (segment below). Adorama also throws in a free LG Super Drive. In addition to price breaks, some resellers only collect sales tax on orders in a handful of states. B&H Photo, for example, only collect sales tax if you live in NY, while Adorama only collects for customers living in NJ or NY. Similarly, MacMall collects sales tax in CA, CO, GA, IL, MN, NC, NY, TN and WI. For those customers who prefer to purchase their new MacBook with AppleCare extended protection, Apple Authorized Reseller Adorama has teamed exclusively with AppleInsider to offer readers between $138 and $144 off the purchase of every 12" MacBook with AppleCare included, as can be seen in our Macs with AppleCare Price Guide (segment below). To take advantage of this offer, first make sure that you take 20 second to register & login to Adorama's free VIP customer program. Then use the pricing links below (or in the Macs with AppleCare Price Guide) and add a MacBook with AppleCare bundle to your cart. During check out (right after shipment info and before payment info) apply Promo Code APINSIDER. This promo code ($50 off) combined with Adorama's instant discounts should deliver the prices advertised below. What's more Adorama will only collect sales tax on your order if you live or NY & NJ, which will save most shoppers an additional $100+. Pre-orders for these bundles are generally being filled within one business week & Apple's Authorized Resellers will only charge a customers card once their order is ready to ship out the door. 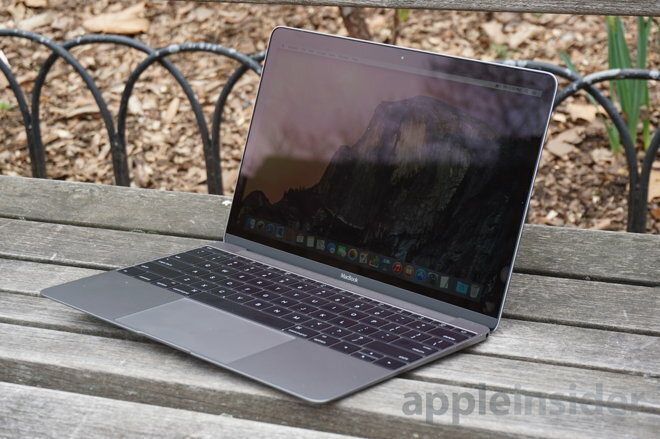 Those readers who are buying a 12" MacBook to replace an existing MacBook may want to consider selling their old MacBook to Gazelle to help offset the cost of the new model. In addition to paying out hundreds of dollars for used laptops, Gazelle lets customers lock in cash estimates for 30 days. This gives sellers an entire month to send in their old MacBook via a pre-paid shipping box after accepting a cash payout offer.